It's blog hop time over at the Scrap 'n Stamp Blog and I thought I'd share the card I'm featuring here as well! 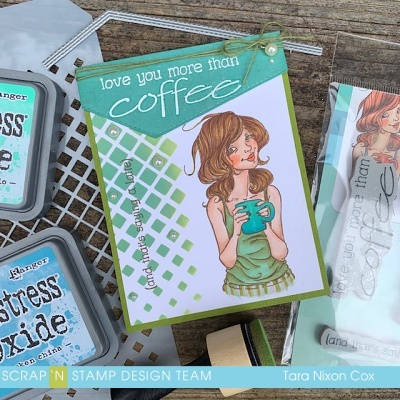 For more pics and full details, and to hop along and see the rest of the design team's creations for our Some Like It Hot Blog Hop, head on over to SNS! I fell in love with this cutie from Penny Black "Saying a Latte" and have been saving her for this hop- I've been out of practice coloring with my Copic Markers, except for small images, but she was a fun one to play with! I actually have 2 cards featuring her to share (since I colored a backup "just in case I mess up" image as well). Since I knew coloring was going to take a bit of time, I kept the rest of my design pretty simple- stamping my sentiment on a panel die cut with MFT's Stitched Edge die. I also just got the new gradient square stencil by Tim Holtz and the angles seemed like a perfect match!